Williams (shoulder, hand) is not in the lineup Tuesday against the Rockies, Matt Breen of The Philadelphia Inquirer reports. Williams has now been on the bench for 11 of the last 12 games -- and eight straight -- as he continues to battle multiple injuries. 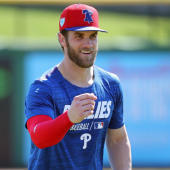 It's unclear if Williams will be able to return before the end of the season, though it wouldn't be surprising if the Phillies opted to shut him down with the team out of playoff contention. Dylan Cozens, Roman Quinn and Odubel Herrera will man Philadelphia's outfield from left to right in this one.